Air potato leaf beetle attacking the invasive air potato plant. The UF/IFAS Extension St Lucie County, UF/IFAS Indian River Research and Education Center, FL Dept of Ag Division of Plant Industry, USDA, and Florida Fish and Wildlife are teaming up with the UF/IFAS Extension Leon County and Florida A&M for the Air Potato Challenge event on May 18, 2018 between the hours of 9 a.m.-noon. Florida residents and public land managers are invited to come out to the FAMU Center for Viticulture and Small Fruit Research to learn more about invasive air potato and the air potato leaf beetle and pick up a supply of beetles for use on their properties. Preregistration is required. Air potato is one of Florida’s most problematic invasive plants. 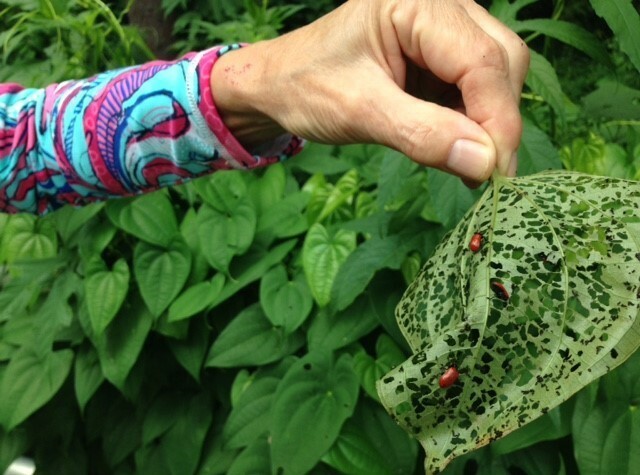 The air potato leaf beetle is a small but formidable enemy of this invasive plant. The insect is bright red, about the size of a pinky fingernail, and has a big appetite for the invasive air potato plant whose vines can completely consume natural areas, smothering other plants and native habitat. Researchers have shown that air potato leaf beetles are host-specific to air potato and will not feed on other plants. The beetles chew through air potatoes leaves, leaving them riddled with holes. During this event, residents and public land managers struggling with invasive air potato can come to the FAMU Center for Viticulture and Small Fruit Research to learn about this invasive pest plant and receive a supply of air potato leaf beetles for use on their properties. There is no charge for this program. The insects will only be available for pick up during this event. Residents are encouraged to bring a cutting of air potato for confirmation. Time: 9 a.m. – 12:00 p.m.
For more information, call Ken Gioeli at 772-462-1660 or ktgioeli@ufl.edu.